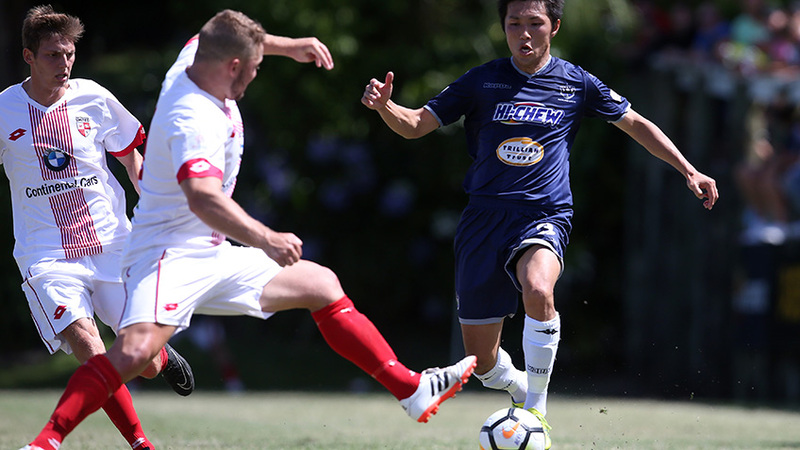 AUCKLAND, New Zealand - Fitness will be a key factor when Auckland City FC take on Waitakere United in the Super City derby that welcomes in the New Year on Sunday. After a two week break for his squad, replete with the usual festive good cheer of food, presents and relaxation, coach Ramon Tribulietx said the match at Trusts Arena poses many questions for both teams. "We're lucky to have a dedicated group who have looked after themselves after two weeks without competition and training, but of course they had a lot of family time, big meals and a chance to rest, so there is always a question mark how they will respond when they return to action. "Both teams are in the same situation so that's what makes thes egames unpredictable. On Sunday, more than ever, we need to be very good on the ball. Trusts Arena is a big pitch and we'll have to be good at this aspect of the game if we want to succeed," he said. Waitakere United's season has taken a nosedive with the Chris Milicich-coached side without a win in their last five matches, having lost to Hawke's Bay United (4-0), Eastern Suburbs (2-0), Canterbury United (2-1) and Hamilton Wanderers (4-3). Despite the downturn in form and a high turnover of players, Waitakere United have the upperhand in the last four Super City derbies, beating Auckland City FC twice in 2016-17 and picking up a 2-2 draw at Kiwitea Street just under a year ago. Their last meeting at Trusts Arena ended with Auckland City FC defeating Waitakere United in convincing fashion 5-0. Tribulietx's resources received a boost with the signing of two new players. Patrick Lundemo, 24, joins Auckland City FC from Sweden and can play as either a striker or defender, while Omar Guardiola arrives at Kiwitea Street after an impressive campaign with Southern United. Guardiola is of Colombian extraction but holds New Zealand citizenship, another plus for Tribulietx as he prepares his side for their OFC Champions League campaign. Guardiola, who played 18 times for the Paul O'Reilly-coached side, faces a spell on the sidelines after picking up a hamstring strain in his final outing for Southern United but Tribulietx anticipates no major problems for the midfielder in his recovery. "Omar comes to us with an injury which we assessed and he's going to need a few weeks. He's a special player who can impact a match in a different way and he possesses similar qualities to Luis Corrales. "He was impressive in his first season with Southern United and is very fast, runs well into space, technically very good but as always, he's coming from a different environment and will take time to adjust to how we do things. "Omar is someone who can definitely give us something that can make a difference. He's a player who is very difficult to defend against and his versatility can give us an edge when it comes to the ISPS Handa Premiership and OFC Champions League," Tribulietx said. "We wanted to have a look at Patrick - he's still very young, technically he's very good and physically he's also very impressive. We think he's a player we can possibly get something out of as we pursue our objectives," he added. Auckland City FC has a thick run of games ahead of them with a trip to the Solomon Islands and off the back of eight straight domestic wins, Tribulietx has a selection headache in front him with Albert Riera and Fabrizio Tavano on their way back. "These players have been very important to us over the years but we've had others come into the mix who have proved that we can trust them which is great to see. "We've got a lot of big games and overseas trips coming up so we need a big squad of players. Its great to have Albert and Fabrizio coming back into the mix but we've had a lot of youngsters put their hands up since September," he said. While Tavano, Riera, David Browne and Micah Lea'alafa have all returned from injury and suspension, Auckland City FC will be without All Whites defender Te Atawhai Hudson-Wihongi who picked up a calf strain at training. The match takes place at Trusts Arena on Sunday 6 January, 2019, and kicks off at 2pm NZST. AC (squad chosen from): 1. Enaut ZUBIKARAI (GK), 2. Hayden McHENERY, 3. Takuya IWATA, 4. Mario BILEN, 5. Angel BERLANGA (c), 6. Brian KALTAK, 7. Cam HOWIESON, 8. Albert RIERA, 9. Javier LOPEZ, 10. Micah LEA'ALAFA, 11. Fabrizio TAVANO, 12. Dylan MANICKUM, 13. Patrick LUNDEMO, 14. Jordan VALE, 15. Dan MORGAN, 16. Yousif ALI, 17. Reid DRAKE, 18. Ruben PARKER (GK), 19. David BROWNE, 21. Maro BONSU-MARO, 23. Alfie ROGERS, 24. Cameron BROWN (GK). INJURED: 20. Te Atawhai HUDSON-WIHONGI (calf), 22. Omar GUARDIOLA (hamstring).